A gift left in your will or trust or by designating American Atheists as a beneficiary shows your commitment to protecting the absolute separation of religion and government and ensuring that the voices of atheists are never silenced in our public discourse. Your dedication to our work can be a part of your legacy. 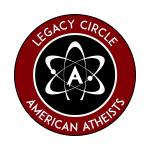 By adding American Atheists to your will or trust or designating American Atheists as a beneficiary, you can join the American Atheists Legacy Circle. Legacy Circle members receive a lifetime subscription to our members-only newsletter, a Legacy Circle lapel pin, and a special thank you gift at the time of your pledge. Be sure to let us know if you have included American Atheists in your end of life planning. Providing us with documentation helps to ensure that we receive the gift you intend to make. When we receive your legacy gift, we will add your name to our Legacy Circle Wall at the American Atheists Headquarters as a way of recognizing your lifetime dedication to ensuring positive and lasting change and equality for atheists. There are a number of ways to ensure that your legacy gift to American Atheists has the greatest impact while keeping you in complete control. Or, you can designate American Atheists as the beneficiary of a life insurance policy. A bequest in your will is one of the most popular ways to join the Legacy Circle and helps guarantee that American Atheists will continue to be the leading voice for atheism and the absolute separation of religion from government for years to come. You are in control of your assets during your lifetime and you are free to change your beneficiaries or the distribution of your assets at any time. Making a bequest through your will can be as simple as adding a few sentences. You can make a lasting impact on our work while still providing for your loved ones or other nonprofit organizations. Your support ensures the continued success and growth of American Atheists no matter how modest your gift. A general bequest leaving American Atheists with a specific sum of money or percentage of your will or trust. A residual bequest for a percentage of the “rest, residue, and remainder” of your estate once you have made all of your specific bequests and all debts and taxes have been paid. A contingent bequest that leaves American Atheists with a share of your estate only if a named beneficiary does not survive you. A life income bequest whereby after your death, income is paid to another individual for his/her lifetime, and American Atheists receives the remainder. Specific bequest language is below. Include a life income bequest whereby after your death, income is paid to another individual for his/her lifetime. After that individual’s lifetime, American Atheists will receive the remainder. This type of bequest is often arranged to provide for elderly parents, family members, or friends in special circumstances. Because it can be adapted in a variety of ways to meet your specific needs and circumstances, an attorney should always be consulted when considering a life income bequest. Note: Each person’s legal and financial situation will differ and the laws applicable to estates and trusts vary from state to state. Accordingly, please consult with an attorney with respect to any gifts you may wish to make in your will. You may designate American Atheists as the final beneficiary of a company pension or profit-sharing plan or of a private fund such as an IRA, Keogh, or tax-sheltered annuity. If you are over the age of 59, you may find it advantageous to make an annual charitable gift to American Atheists from your retirement plan to receive a tax-deduction and save yourself and your heirs costly income and estate taxes. This may be especially attractive if you are over the age of 70 and are required by law to begin withdrawing these retirement funds. Because American Atheists is a 501(c)(3) nonprofit organization, we are exempt from paying the taxes that would otherwise be owed by you or your other beneficiaries. Consider making your Legacy Circle Gift to American Atheists and using other, less heavily taxed assets to provide for your loved ones. Simply designate American Atheists (Federal Tax Identification Number 74-2466507), located at 225 Cristiani St, Cranford NJ 07016 as the beneficiary of your retirement plan, IRA account, or other financial account. Please contact us with any questions about your Legacy Circle Giving plans or to let us know that you have designated American Atheists as a beneficiary of your retirement plan or financial account. You may decide to include American Atheists as a beneficiary of a life insurance plan you already have. To do this, you need to contact your insurance company and formally designate American Atheists as a beneficiary of your policy. You may have purchased a life insurance plan that is now fully paid that you no longer need. By transfering ownership and beneficiary status to American Atheists you can receive an immediate income tax deduction and make a significant gift to American Atheists. You may wish to purchase a new insurance policy naming American Atheists as a beneficiary or co-beneficiary. This may be a convenient way of making a special gift that is much larger than its cost to you. If ownership and beneficiary status are transferred to America Atheists your annual insurance payments are tax-deductible.